Molecular chips; ionic circuits; photonics R&D consortium. Researchers from various organizations have devised a transistor consisting of a single molecule and a few atoms. The work could one day lead to the integration of molecular-based devices with existing semiconductor technologies. This work was conducted by Paul-Drude-Institut für Festkörperelektronik (PDI), Freie Universität Berlin (FUB), NTT and the U.S. Naval Research Laboratory (NRL). 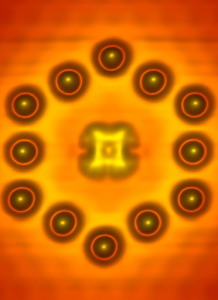 Using a scanning tunneling microscope (STM), researchers developed a tiny transistor. It consists of a single organic molecule and positively charged metal atoms on the surface of an indium arsenide (InAs) crystal. Molecular beam epitaxy (MBE) was used to prepare the surface. Then, the STM was used to assemble electrical gates from the +1 charged atoms with atomic precision. The tool also placed the molecule at positions close to the gates. The Weizmann Institute of Science has taken a step towards the development of artificial ionic circuits. The organization is also pioneering the field of nanoionics, in which ionic currents are conducted on the scale of nanometers. By definition, ions are atoms with extra electrons or missing electrons. In one case, the brain conducts electric signals using ions. Using this concept, researchers believe that ions could one day become more efficient than current electronic devices. Ionic devices are not faster than today’s chips, but they may require less power. Applications include ion-based memories and other chips. Researchers from Weizmann have devised a method for making ion-conducting channels. To create these channels on a solid surface, researchers used a self-assembled organic monolayer processing technique. Then, they pattern ion-conducting channels on the top surface of the monolayer. This is done using an atomic force microscope (AFM) at linewidth geometries down to 10nm and lengths up to a hundred micrometers. In addition, using a mask, researchers can pattern larger ion-conducting channels covering surface areas of up to several square centimeters. The Research Foundation for the State University of New York (RF SUNY) has been selected by the U.S. Department of Defense to lead a U.S.-backed photonics R&D consortium. The R&D effort, to be based in Rochester, N.Y., is called the Manufacturing Innovation Institute for Integrated Photonics. The photonics consortium involves 124 companies, nonprofits, and universities. The investment in the effort is over $610 million—$110 million in federal funds and more than $500 million in non-federal contributions. • Develop an end-to-end photonics ecosystem in the U.S. This includes a domestic foundry access, design tools, automated packaging, and assembly and testing. • Create a standardized platform currently lacking in the integrated photonics space. • Assemble a team of organizations from across the photonics industry, including manufacturers, material suppliers and software developers, government and academia. • Pair photonics companies, such as Analog Photonics, Juniper Networks, and OptiPro, with key end users like Northrop Grumman, Hewlett-Packard and others. It also hopes to work with universities like the University of Rochester and the California Institute of Technology.